Panasonic's GH line of mirrorless cameras has very much proved itself as one of the most credible options for filmmakers, and the past year has been all about the flagship GH5. As a 20MP Micro Four Thirds camera, with the ability to capture footage in two flavours of 4K and an exhaustive array of shooting options and customisations on top of it, the GH5 has massive appeal to those looking to take video shooting more seriously than the norm. So what's Panasonic's justification for its release? And what exactly does it offer that the GH5 doesn't? Here's a quick look at ten things you need to know. At a time when most other cameras are packing 24MP or 30MP+ sensors, the decision to opt for a newly designed 10MP one might seem odd. Most of the recent Lumix models themselves have gone with either 20MP or 16MP versions. 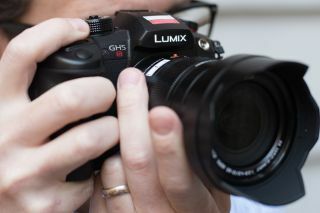 Even Panasonic's very first mirrorless, the ten-year-old Lumix G1, sported one with 12MP. This is, however, a camera designed for 4K video recording, and you don't need more than 10MP in order to record 4K footage. It's not that unusual a decision when you consider that's Sony's video-centric A7S line of cameras continues to use 12MP sensors (albeit, full frame ones). Normally when you adjust the aspect ratio on a camera, the change to the angle of view means that your effective focal length changes too. So, whereas you may be using a camera with a 24mm lens as standard, changing between 4:3 and 3:2 can mean that you end up using something slightly closer to 25mm in the latter option. Not so on the GH5S. Thanks to the same Multi Aspect Ratio sensor tech as seen on a handful of previous models, you retain the same focal length when using any aspect ratio, be it in stills or video shooting. We've seen this kind of sensor in previous Panasonic models such as the GH2 and LX100, and it makes a return on the GH5S. Panasonic has made a lot of noise about the ability to have image stabilisation inside the body and inside the lens, and the benefits of the two systems working together. Dubbed Dual I.S., this has been an option on many recent Lumix models such as the GH5 and G9. On the GH5S, however, body-based IS has not been included, which means that you need to use a lens-based system if you want to take advantage of it. Of course, for tripod-based filmmaking, this may not be an issue as you would naturally deactivate such a system anyway. The working range of an AF system gives you an idea of how well a camera can focus in low-light conditions. Lower numbers correspond with greater sensitivity here, and figures of -1EV or -2EV are expected for entry-level cameras, while enthusiast and professional bodies may stretch to -3EV (Canon's EOS 1D X Mark II, for example) or even -4EV (Nikon's D5). Panasonic's GH5S, however, promises sensitivity down to -5EV, which bodes very well for use in darker conditions. We haven't had a chance to test this yet, and it's worth bearing in mind that on many cameras these figures are typically maximum figures set for the most sensitive central part of the focusing system, but it's something to get excited about if you know you'll be relying on autofocus in tricky lighting conditions. The main shooting screen, which displays things like shutter speed, ISO, white balance and so on, can be changed between three different displays. Those shooting stills will want to use the standard Photo mode, while those shooting video can choose from either Film maker or Video Creator options. While the format is still broadly the same for all three, the Film maker option shows the shutter angle instead of shutter speed, while Video Creator displays gain instead of ISO. Whereas the GH5 offers shooting in a range of frame rates to 50/60p in 4K UHD, it only offers 24p shooting when you switch to the slightly wider DCI 4K format. On the GH5S, however, you can use 24p, 25p, 30p, 50p or 60p options in either format. That's not all though. The Variable Frame Rate option allows you to adjust capture rates to a maximum 240fps while retaining a Full HD resolution, and the sensor uses its full width to record here, so there's no crop factor to work out. This isn't the case on certain other 4K-enabled cameras, which complicates things if you're trying to retain the angle of view of wide-angle lenses. Log shooting allows videographers to get a good starting point for grading, and this is something that has become very desirable in cameras in this category. The GH5 did not come with this installed as standard – instead, it was a paid-for update, which did not please those who expected it to be bundled in with the rest of the camera's functionality. Fortunately, the GH5S has this installed so it can be used straight out of the box. The GH5S is the first G-series model to offer a feature dubbed Dual Native ISO. Its purpose is to allow for "super high sensitivity shooting with low noise." Normally, we're advised to use a camera at its 'native' ISO setting as this tends to produce the best signal-to-noise ratio, which means that images should show less noise and more detail. Here, there are two native settings: ISO 400 and ISO 2500. The feature works by using two read-out circuits per pixel (rather than the more common one), and the camera can choose which circuit to use before amplifying the signal to produce the best result. This isn't a new feature as such – its been on Panasonic's Varicam models, for example, for some time – although it's the first time we've seen it selectable on a Panasonic G-series camera. Many video-focused cameras offer timecode, but the fact that the GH5S can output this makes it easy to synchronise with other GH5S bodies or other cameras. This works through the flash sync socket, via an included BNC conversion cable, and means that if you're working with a number of cameras in the same shoot, you can just sync them up before you start to make life easier when it comes to editing footage.